Kash is ready for it all with Rachel, especially if “all” includes having a football team of babies with his future wife. In his line of work, Kash knows how short life can be and doesn’t want to waste another minute of their life together. But now his past as an undercover narcotics agent has come back to haunt him . . . and it’s the girl he loves who’s caught in the middle. Trent Cruz’s orders are clear: take the girl. But there’s something about this girl that has him changing the rules and playing a dangerous game to keep her safe. When his time as Rachel’s protector runs out, Trent will turn his back on the only life he’s known—and risk everything if it means getting her out alive. Molly McAdams grew up in California but now lives in the oh-so-amazing state of Texas with her husband and furry four-legged daughters. Her hobbies include hiking, snowboarding, traveling, and long walks on the beach . . . which roughly translates to being a homebody and dishing out movie quotes with her hubby, or hiding in her writing cave trying to get her characters’ stories out. In any case, jumping into this series in the middle wasn’t much of a problem, as Molly McAdams writes characters so real, so familiar, that it was very like visiting long-lost relatives: the rhythms are in your blood, but the details are new. What I especially like is the way McAdams writes relationships. While Rachel and Kash are young, they’re still absolutely adults – dealing with adult issues, like when (and whether) to start a family, adopting an animal, old lovers, etc, and I felt like the shoe conversation in the first few chapters was especially dead on. I mean, my husband and I had similar conversations when we were first combining our households. 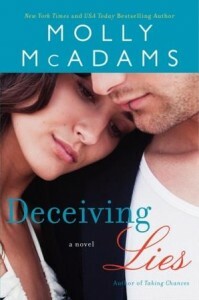 I don’t read a lot of “typical” romances, but McAdams’ series is anything buy typical. This novel, in particular, included a nice balance of jeopardy, drama, and happy relationships, which made it the perfect beach book, even though it didn’t take place anywhere near the beach. Goes well with limonada mineral and grilled shrimp tacos. This tour is part of a virtual book tour sponsored by TLC Book Tours. For more information, click here.